The 2018 show saw winners including 'Three Billboards', 'Veep' and 'Big Little Lies'. Another Screen Actors Guild Awards show has come and gone and with it comes some well deserved winners, an outstanding first ever host and a few brilliantly heartwarming moments. Much like the Golden Globes, it was a very much a #MeToo centred event once again. The big winner in the motion picture categories was, of course, 'Three Billboards Outside of Ebbing, Missouri' which took home Outstanding Performance by a Cast with Frances McDormand landing the Lead Actress prize and Sam Rockwell getting Outstanding Supporting Actor. She spits verses about what happened in the first season. If you haven't yet got round to watching the second season of 'Stranger Things', Millie Bobby Brown gives a recap of the entire first series in the best way possible. She appeared on 'The Tonight Show Starring Jimmy Fallon' to deliver an epic rap about everything that went on to set up the new episodes. Millie Bobby Brown fans will know that this is a 13-year-old that can really sing! But not only that, she also has some pretty decent rapping skills, as she previously demonstrated with Eminem and Rihanna's song 'Monster' on more than one occasion. But these new verses of hers are first rate. 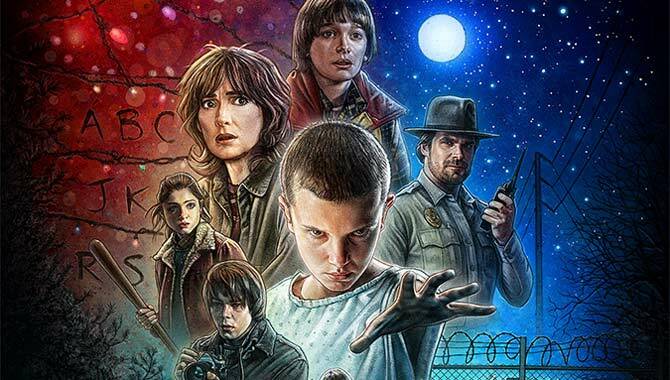 'Stranger Things' is without a doubt one of the most successful original Netflix properties that the streaming service has ever brought to subscribers. Hitting the streamer with its first season back in 2016, the show became an instant hit thanks to its incredible roster of talents, both young and old. One of the breakout stars of the show was of course young Millie Bobby Brown - a British actress who played child of few words, Eleven. It soon became clear that Eleven wasn't like the other kids in the fictional town of Hawkins, Indiana, instead embed with psychokinetic abilities that would aid her newfound friends in the search for their missing bestie, Will. The Duffer Brothers and their actors talk about the forthcoming Netflix show. We're drawing ever closer to the season two premiere of 'Stranger Things' and now the cast and the Duffer brothers have opened up about what we can expect from it. They've upped the ante on the horror, and they're answering a lot of questions raised at the end of the first season. What happens to Will in 'Stranger Things' season two? MTV's first ever gender-neutral awards ceremony took place in Los Angeles on Sunday night, and it was a good evening for Brits in general. Emma Watson picked up the first ever gender-neutral prize at the MTV TV & Movie Awards this weekend, as Beauty and the Beast emerged as the main winner of the night. The ex-Harry Potter star, famous for her role as Hermione Granger, picked up the best big-screen actor award at the fan-voted ceremony in Los Angeles on Sunday night (May 7th). Her role as Belle has helped generate worldwide revenue of over $1 billion for Beauty and the Beast since its release just over a month ago. The Super Bowl released a brand new trailer for the most anticipated Netflix return of the year. A brand new teaser trailer for the upcoming second season of 'Stranger Things' was unveiled during the Super Bowl on Sunday, plus we also find out when exactly we can expect to see it this year. The bad news is, we've a long time to wait yet. The good news is, we now have plans in place for Halloween 2017. The trailer for the critically acclaimed sci-fi-fantasy series was launched yesterday (February 5th 2017), kicking off with a very 80s Eggo advert (obviously Eleven's favourite food), and we see Mike Wheeler (Finn Wolfhard), Dustin Henderson (Gaten Matarazzo) and Lucas Sinclair (Caleb McLaughlin) in full Ghostbusters costumes. The actress has been announced to star in 'Godzilla: King of Monsters'. It was always inevitable that 'Stranger Things' superstar Millie Bobby Brown was going to hit the big screen pretty soon, and sure enough she's set to appear in Michael Dougherty's forthcoming 'Godzilla' sequel 'Godzilla: King of Monsters'. The actress has recently opened up about the new role. Hollywood superstars in the making. 1. Millie Bobby Brown - Matt and Ross Duffer couldn't have imagined the kind of success their 80s inspired supernatural TV series 'Stranger Things' would have, but arguably the world's favourite thing about that show is Millie Bobby Brown, who plays telekinetic labrat Eleven. For a while it was up in the air as to whether or not she would return for the second series given the mysterious fate of her character in the first season's final episode, but recent confirmations suggest we haven't seen the last of her. 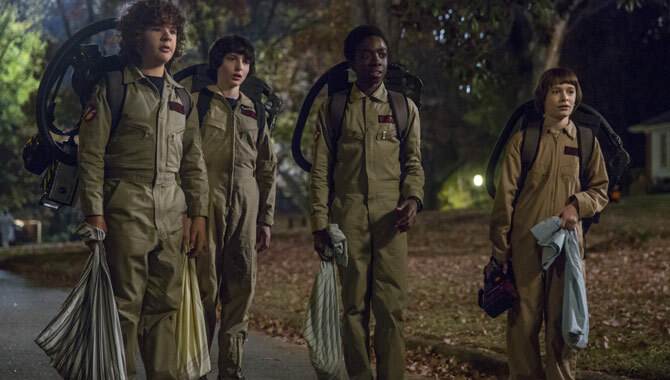 'A Stranger Things Christmas' carries on from where season one ended. 'Stranger Things' has been turned into a 'Peanuts' style cartoon called 'A Stranger Things Christmas' which has now gone viral. Apparently kicking off from where season one left off, it follows the same format as 'A Charlie Brown Christmas' and features several of the main characters as Charles Schulz cartoons. 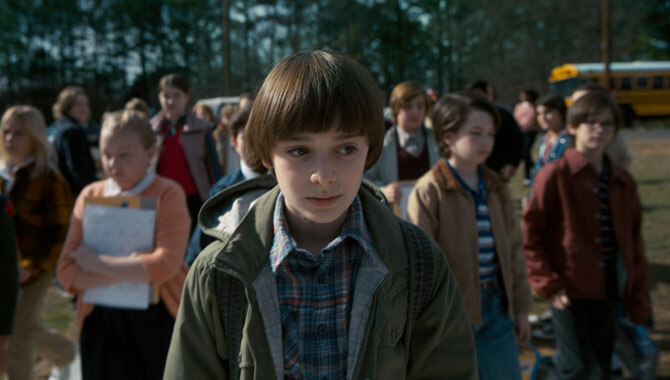 The short film was created by filmmaking duo Leigh Lahav and Oren Mendez and follows Will Byers in the aftermath of his rescue from the Upside Down. Despite being apparently safe and well at home, he just can't shake the feeling that something's wrong with him. Possibly because he keeps regurgitating alien slugs. New characters, new inspiration and new themes. Netflix original series 'Stranger Things' continues to be a major talking point everywhere, and everyone's getting more and more excited for the season 2 premiere next year. It's shrouded in mystery; we don't even know if we'll see Eleven again; but we've managed to get a few glimpses into the next chapter. Her parents weren't too fond of the idea. If you watched 'Stranger Things' on Netflix, then you're almost definitely a fan of Millie Bobby Brown; the shaven-headed little girl who plays the mysterious telekinetic child Eleven. If that girl isn't destined for huge things in the future then we don't know who is. But just how did this 12-year-old survive her first daunting head-shave? As it turns out, pretty easily. The actress shared a video of herself getting the chop, while pulling funny faces and not shedding a single tear. The hairdresser is seen carefully cutting the hair at the roots and passing each section to another person who appears to lay it out on the side. It sure looks as though their trying to keep all the hair intact, possibly because she's donating her locks to a charity that makes wigs for children with cancer? We hope so. 'Here it is!! The video of me getting my hair shaved for #StrangerThings! Enjoy!' She captioned the sped up clip which featured the Beyoncé song 'Pretty Hurts'. Apparently, her mother wasn't too happy about the whole thing to begin with, but nothing was stopping Millie once the show's producers showed her a picture of Charlize Theron. A star is in the making. We are already desperate for the next season of Netflix Original series 'Stranger Things' now that it's exactly one month on since all eight episodes of season one aired. We definitely weren't the only ones who binge-watched this sci-fi horror adventure in one go, captivated by the acting talent of today's youth. Will finally returned to his family after a mysterious force rendered him missing, but it seems his torment is not yet over according the the suspenseful conclusion of episode 8 'The Upside Down'. But it's not him we're looking forward to seeing again come season 2, it's his shaven-headed, super-powered girl pal Eleven we are desperate to see.